Jason Williams has the attitude and the talent, but can he deliver at crunch time? More than any other professional sport, basketball is a game of the mind. With so many players learning their game on the street -- where trash talk is as important as a jump shot -- a player's mind is as important as his legs. This is one reason teams lose -- because their players don't believe down deep that they have what it takes to beat their opponents. In their Vancouver incarnation the Grizzlies established new lows for expansion franchises, never managing to win games on a regular basis despite having a good nucleus of young talent. But that Grizz team is gone. 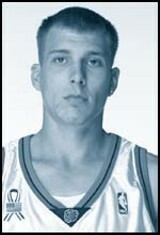 The new version of the squad features point guard Jason Williams. He doesn't understand losing. Maybe it's because he hasn't had much practice at it. His college team at Florida was a winner and his former NBA team, the Sacramento Kings, also enjoyed success in recent seasons. But there is a big difference between an absolute refusal to fold and sheer audacity. In his career Williams has shown both in spades. Ill-advised three-pointers and passing miscues earned him a spot on the bench during the fourth quarter of close games in Sacramento. Memphians got a taste of Williams' audacity in last Sunday night's exhibition game. With five minutes left and the Clippers threatening to tie the score, Williams took the ball to the hoop, faked behind his back, faked right, and then tried to wrap it around -- and presumably into -- the goal. The entire team of Clippers defenders in his way didn't deter him from his doomed mission. Still, Grizzlies coach Sidney Lowe isn't buying into the idea that Williams can't be effective when the game is on the line. "All I'm concerned about is Jason playing basketball the way he's capable of playing," he says. "He's capable of playing and leading our ball club. If he takes the shot, fine. I tell guys if you are open and you think you can shoot it, then shoot it." When asked about Williams' tendency to shoot from the hip, Lowe says: "I think it's blown out of proportion. From this point on I will not answer questions about how to control his shooting, because it's not an issue." Lowe adds, "We want to see how guys work together. Can we finish guys [at the end of a ballgame]? Which group is better at the end? We have to see who fits best with the other four guys." Lowe is a cerebral sort of guy. He talks about thinking ball players and playing "smart." Maybe he's not the Zen master, like L.A.'s Phil Jackson, but Lowe does understand psychology. Was his statement about finding out who can finish a game an indirect message/challenge to Williams? If it was, will "J-Will" hear it? The coach got some answers to that question Monday night. With Memphis down by 14 at the start of the fourth quarter, Lowe gave Williams his day in court. Williams testified, hitting three treys in a 10-point fourth-quarter effort. Fearlessly, audaciously, Williams willed the win for Memphis. True, Shane Battier knocked down his own three treys in the quarter, but Williams hit them at the end of the game, putting Memphis up for good. Afterward, Williams was nonchalant about his effort. "I made a couple of shots," he said. "It's not the end of the world. It's not the beginning. Hopefully, we can be in that position again and I'll do the same thing." The first part of his answer was typical NBA game-speak. The second part -- about being in the position to "do the same thing" -- speaks volumes. Williams wants this team to be his. He wants to play at the end of the game. And he wants his team and his teammates to succeed. If Williams can't produce down the stretch, then he's seen as a bust and arrogant. If he does produce -- like he did on Monday night -- then he'll be seen as an elite point guard. It's far too early to judge how it will play out, but what is apparent now is that Williams doesn't understand losing. The shots that he misses don't seem to register. He shares that trait with Allen Iverson and, yes, Michael Jordan, two players who tend to hoist a few more shots than they hit. But most people don't complain, because their teams win. And such a mentality -- that losing is not an option -- can be contagious. If Williams can engender that attitude in his teammates, this squad will be fine. The Grizzlies are young and have a lot to learn. But Williams is there at the head of the class. And for now, at least, he seems to have all the answers.